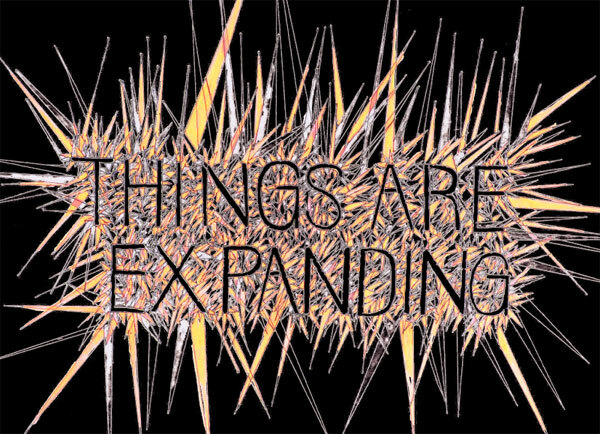 Things Are Expanding, Opening Reception on Friday, Dec. 10, 6-8 pm! I have a collaboration piece in the group show Things Are Expanding at Swarm Gallery in Oakland. Opening Reception is Friday, Dec. 10, 6-8pm. If you are around, come by and enjoy art and music! You can also preview and order our project catalog here. Successful collaboration can be likened to a color wheel. Complimentary colors are in striking contrast to each other; when juxtaposed, each appears brighter and more intense. The opposition between the two gives the combination more power than each element could achieve on its own. The process: Swarm invited fourteen of its gallery artists to invite another artist of their choosing (from outside the gallery) to collaborate on a piece. We encouraged the artists to invite someone whose work they admire, but who works differently – either in medium, creative style, concept, or all of the above – to “stretch their creative muscles”.